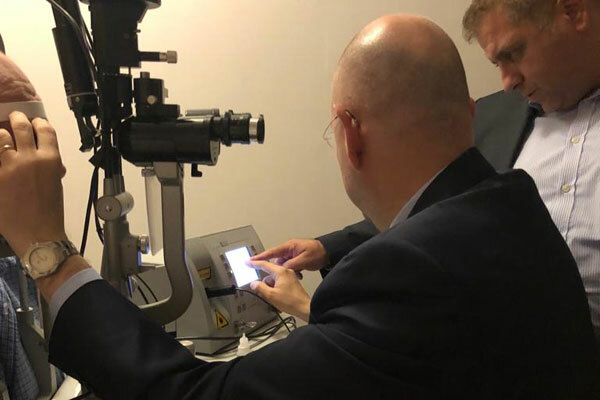 Moorfields Eye Hospital Dubai, the first overseas branch of the Moorfields London hospital, has introduced a new advanced treatment for retinal conditions - some of the common eye problems facing people in the Middle East. Photodynamic therapy (PDT) is a treatment that involves the use of light-sensitive medication and a cold laser to destroy abnormal cells. It can be used to treat some eye conditions – especially those of the retina, including age-related macular degeneration - and skin conditions, as well as certain types of cancer. Photodynamic Therapy is a highly specialised treatment and painless procedure used to destroy abnormal blood vessels in the eye. PDT has been around since the early 2000s but it is finding new applications and has become an established form of treatment for certain ophthalmologic conditions, including Age-related Macular Degeneration and others. The Moorfields Dubai team used PDT for the first time to treat a patient with Central Serous Retinopathy. This is a condition in which fluid builds up behind the retina and affects the vision – it can even cause a partial detachment of the retina. If left untreated, it can also cause permanent loss of central vision and some treatments can lead to tissue scarring, which in turn may also lead to impaired vision. The PDT procedure starts with the slow injection of a drug - Visudyne (verteporfin) - through a vein in the patient’s arm. Once completed, a low power ‘cold’ laser is then shone into the eye, focusing on the treatment area for just over a minute to activate the Visudyne. On their own, the medication and light source are both harmless but by combining the two and applying the cold laser light, the medication becomes active and causes a reaction that damages the vessels. PDT is generally used to treat the smallest tumours (choroidal melanoma) with very good results, treating small areas of tissue without the need for surgery.